.Leeds Holbeck's Royal Scots were moved to Low Moor shed in September 1962 after the Settle & Carlisle had been dieselised. Richard Greenwood notes that the class were banned from the Liverpool Exchange - Wigan Wallgate route via Rainford Juncion, and there was only one train through the Calder Valley on which they could be used. This was the morning (about 7.15am) Bradford to Manchester Victoria stopper which then formed the 9.12 a.m. Victoria to Southport. The loco returned on the 1.10pm Southport to Leeds and Bradford Express, passing Hall Royd at around 14:51. By mid November the locos had all left Low Moor never to return and went to Mirfield where they were used as freight locos. At Whitsuntide 1962 two excursions over Copy Pit were in the hands of Mirfield Royal Scots. Richard also notes that there were a number of Royal Scots used on Todmorden to Victoria stoppers and vice versa over the years. 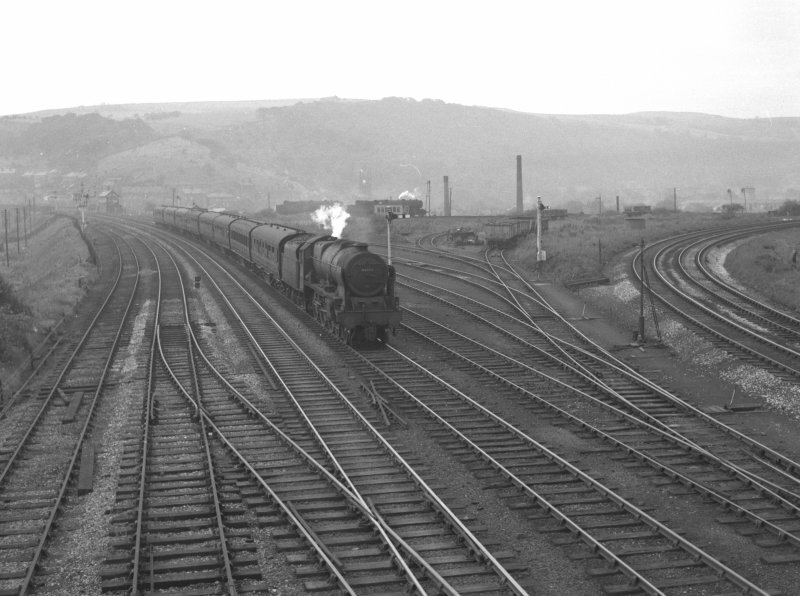 This photograph shows 46130 'Cameronian' - then resident at Low Moor - passing the Hall Royd exchange sidings in 1962. Royal Scot 46113 passes Hall Royd sidings with the 13.30 Southport - Leeds & Bradford sometime in 1962.